The Operation Game features bells, burps, barks and more! Grab your tweezers and hold your hand steady. We recommend NOT drinking lots of coffee before play. What do you hear? It sounds like a toilet flushing...looks like Cavity Sam has a case of bad plumbing! EEK! Can you "operate" and help him out? 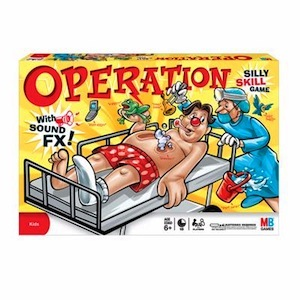 Press his nose to find out if your operation was a success, then listen up and the game will tell you what to grab next. Will you be the top doc? 4 "AA" batteries (not included). Ages 6 and up.